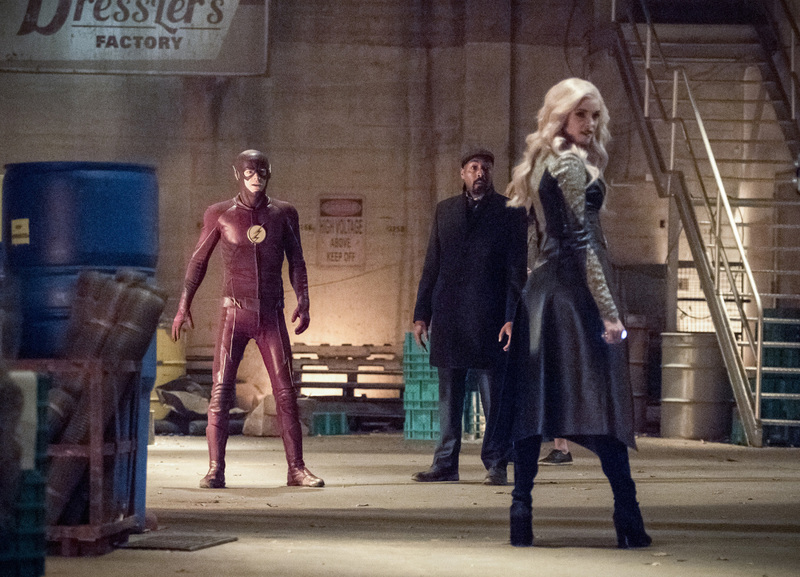 The Flash -- "I Know Who You Are" -- FLA320b_0054b.jpg -- Pictured (L-R): Grant Gustin as The Flash, Jesse L. Martin as Detective Joe West and Danielle Panabaker as Killer Frost -- Photo: Dean Buscher/The CW -- ÃÂ© 2017 The CW Network, LLC. All rights reserved. We find out who is Savitar and if I didn’t read some theorizes on who he could be, I would have been shocked. Alas, I did read some spoilers so it wasn’t as surprising. And we do open with Barry revealing to Savitar in a confrontation that he knows who he is. We then go back to 16 hours ago with Team Flash looking at the future accomplishments of Tracy Brand, the woman that 2024 Barry said would build a device to trap Savitar in the speed force. The team come up with a plan to get Tracy to come up with the trap now instead of four years from now. Julian, however, wants Team Flash to concentrate on finding Caitlin and feels they aren’t doing enough. Team Flash counters they’ve done so much already and now need to concentrate on trapping Savitar and her possible team up with him. We also learn that Wally has decided to go to Earth-3 for a little vacation to see Jesse. Cisco, Barry and HR go see Tracy in her lab at CCU. But it looks like Tracy is giving up on her research because she thinks it is wrong and won’t work. Barry tries to convince Tracy otherwise and is spounting her future work back to her but for now those are just theorizes. Also after Tracy is Killer Frost. Barry manages to whisk her to safety. Cisco tries to confront Killer Frost but hesitates which allows her to send an icy blast his way. Barry manages to use a flame to send Killed Frost running. Savitar isn’t happy that Killer Frost didn’t live up to her name and killed Tracy. So Team Flash is surprised that the team up with Killer Frost and Caitlin has come so suddenly. Meanwhile at the CCPD, Tracy gives a sketch artist a description of who attacked her and it is a good likeness of Killer Frost. Joe and Barry try and get Tracy to stay in police protection but she says she is fine and runs to catch her bus. Team Flash doesn’t give up on Tracy and sends HR to flirt his way to her. HR offers to pay for Tracy’s coffee at a Jitters. Cisco is feeding HR lines on what to say to Tracy to make him sound like a genius. In the truck outside the Jitters, Julian noticed Cisco’s hesitance at confronting Caitlin and wants to know why. Cisco, meanwhile, rather not talk about it but deal with Tracy. During their coffee, Tracy talks about researching speedsters and how she believes that it not just lightening that they leave behind but something else. HR calls it the speed force and Tracy likes that name. As they continue to talk, HR notices his coffee gone ice cold and realizes Killer Frost is there. HR calls in for reinforcements. The Flash and Killer Frost chase each other around the city with Killer Frost riding her icicles. Barry is hoping to lead Killer Frost back to Cisco who would vibe blast her. However, once again Cisco hesitates and is blasted away again. Killer Frost then blasts Barry and stabs him in the leg with one of her icicles. Back at STAR Labs, Tracy can’t believe she is in the Flash’s lair. Team Flash shows Tracy her future and she can’t believe what her research leads her. The Flash tells Tracy about Savitar and that she needs to develop a trap to catch him now. Tracy freaks out and rushes out. HR chases after her. In Cisco’s lab, Julian finally gets Cisco to admit he hesitated both times because he fears killing Caitlin with her powers. HR interrupts to tell them that Tracy is gone but thanks to the future hologram, he knows where she went. HR finds Tracy at a statue of Galileo. Tracy admits knowing her theorizes are true freaked her out a bit. HR gives her a pep talk and it looks like Tracy is back on board to help Team Flash. Meanwhile, Joe and Cecile seem to be taking things to the next level. Cecile tells Joe that she loves him but he does not reciprocate. Barry tells Joe that if he does love Cecile that he needs to tell her about him being the Flash and Wally Kid Flash. Joe was reluctant because he wanted to keep the one normal thing in his life normal. Barry counters that nothing in their lives are normal. When Cecile goes to see Joe, she understands if he isn’t ready to say I love you back but instead Joe breaks up with her. Cecile leaves but comes back with Killer Frost holding an icicle knife to her throat. Killer Frost promises not to kill Cecile if Team Flash brings Tracy Brand to her at a specified address. HR talks to Tracy who has come up with a way to use Savitar’s suit against him in order to trap him. HR then asks Tracy for a favor in allowing Team Flash to use her as bait to save Cecile. The Flash — “I Know Who You Are” — FLA320b_0035b.jpg — Pictured (L-R): Grant Gustin as The Flash, Jesse L. Martin as Detective Joe West, Danielle Nicolet as D.A. Cecile Horton and Anne Dudek as Tracy Brand — Photo: Dean Buscher/The CW — ÃÂ© 2017 The CW Network, LLC. All rights reserved. The Flash, Joe and Tracy go to a warehouse where Killer Frost is holding Cecile. Cecile is fine and Killer Frost appears and says she isn’t interested in killing Cecile but Tracy. The Flash tries to talk to Caitlin and convince her not to hurt anyone. However, each time Barry speaks, Killer Frost speaks the same lines back at him at the same time. Killer Frost mentions that Savitar always knows what is going to happen because he has lived it. Killer Frost also knows that Cisco is in the rafters and sets off an explosion to bring it down. Cisco vibes portals to land him safely. We then get a Vibe versus Killer Frost showdown that Vibe wins allowing him to take a sample of her blood. However, Savitar arrives. Instead of killing Tracy, he snatches Killer Frost and speeds off. Back at STAR Labs, Julian hopes to use the sample of Killer Frost’s blood to reverse engineer her condition and get Caitlin back. And at the CCPD, Joe asks to see Cecile and admits that he pushed her away because of the crazy life that he leads. Joe tells Cecile he isn’t pushing her away anymore and takes of his wedding ring and tells her he loves her too. Joe then tells Cecile that Barry is the Flash and Wally is Kid Flash. Joe comes home to see Wally has returned from his trip. Wally talks about his time on Earth-3 and while the family is catching up that Barry realizes who Savitar is. Barry speeds off yells for Savitar to confront him. Barry realizes how Savitar knows everything about Team Flash and their weaknesses because Savitar is him. We see a scarred up Future Barry emerge from Savitar’s shell and the two Barry’s have a stare down.